I do love a good Bomb Pop in the summer. Three distinct tasty flavors, the creamy consistency (only the Original Bomb Pop. Accept no imposters! )…a perfect summer treat. 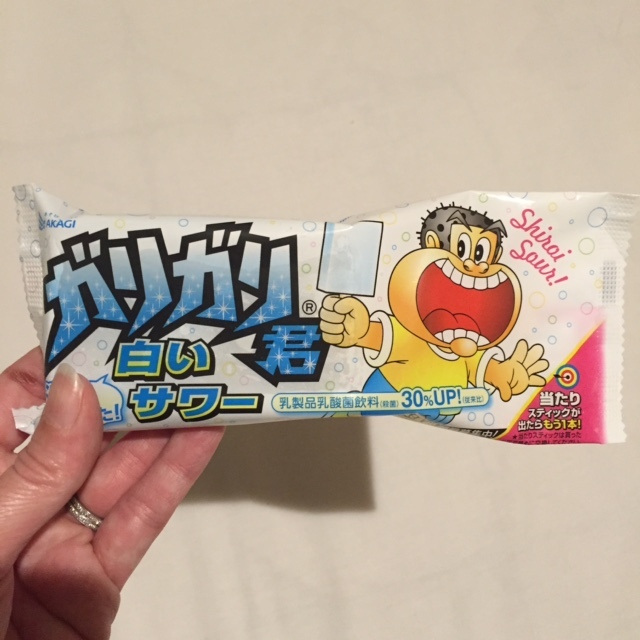 But, my love for the Bomb Pop has been eclipsed since I was introduced to Japan’s favorite popscicle, the GariGarikun. Naoto brought a box of original ramune flavor GariGarikun pops home from Mitsuwa last summer and I fell in love. 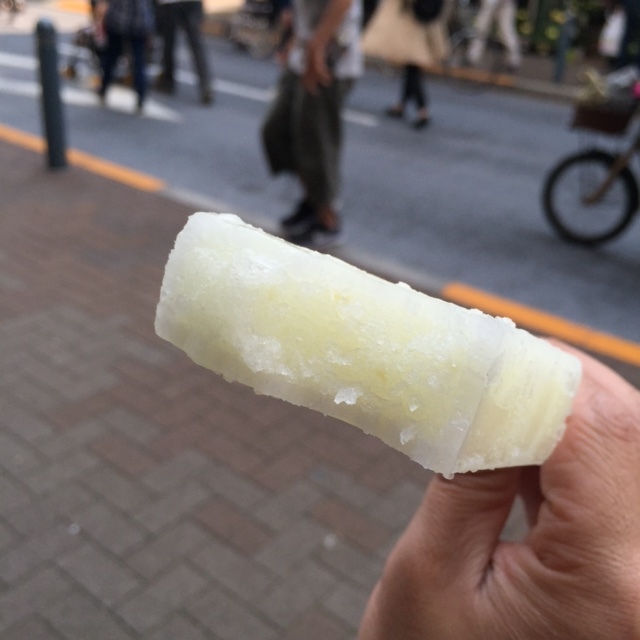 On the outside, they look like regular ice pops, but once you bite into one, you see that the “regular” ice pop part is just a shell holding tiny slushie-like ice crystals on the inside. They are so tasty and so fun to eat! On our first night in Japan, we got to our hotel after 10PM and I was exhausted. But Naoto went downstairs to Lawson’s conbini (convenience store) and got himself a beer and brought me a Sicilian Lemon GariGarikun. I had no idea there were special and limited flavors of the treat so I was super-excited to try it. Sooooo tart and lemony!! I slept well after that midnight snack and the next day, I started my mission to pop into every conbini to check their supply of GariGarikun to see what other flavors I could try. (Doesn’t traveling with me sound like fun?!) 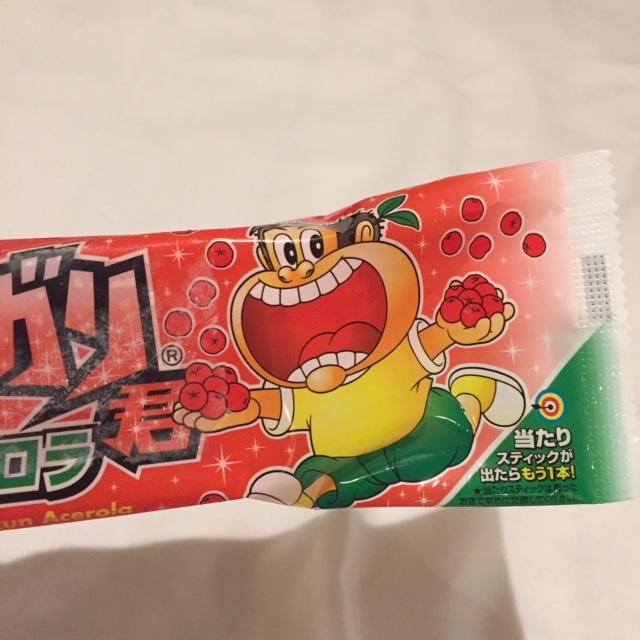 So I tried lychee… …and acerola, which is like a cherry, but somehow more delicious. I tried Shiroi Sour, which is like Calpico, a Japanese soft drink. And, pictured at the top, I also tried kiwi. I can’t tell you which one was the best because I loved each and every one at the moment I was eating it. They were all really refreshing, not too sweet, and packed with flavor. Recently the makers of GariGarikun increased the price from ¥60 to ¥70 (~ $0.54 to $0.63). It’s the first price increase for the frozen treat in twenty-five years and also the second reason the GariGarikun is a JDIB. Where in the US can you find a summer treat at a convenience store for sixty-three cents??!! But even better, the company made a commercial apologizing for the unfortunate price increase. Can you imagine? (If you want to read more about this, go here.) You can (hopefully) watch the commercial below to see the sincerity in the apology. Oh Japan…you’re the best. 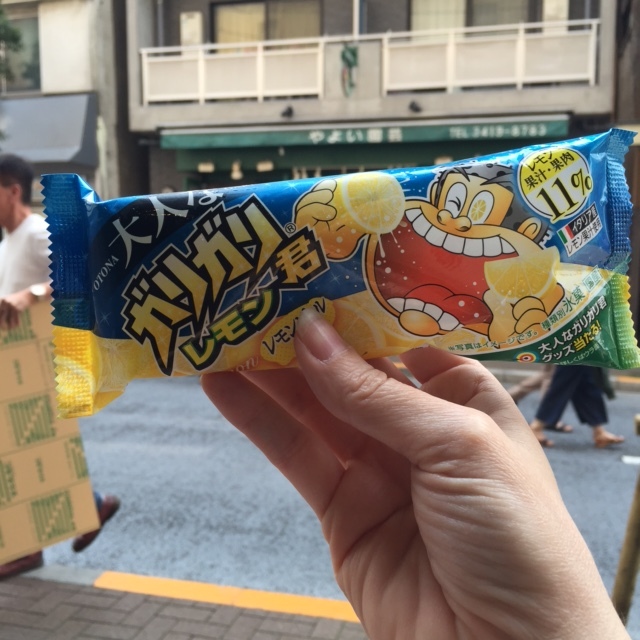 And GariGarikun, a summer treat where Japan Does It Better! 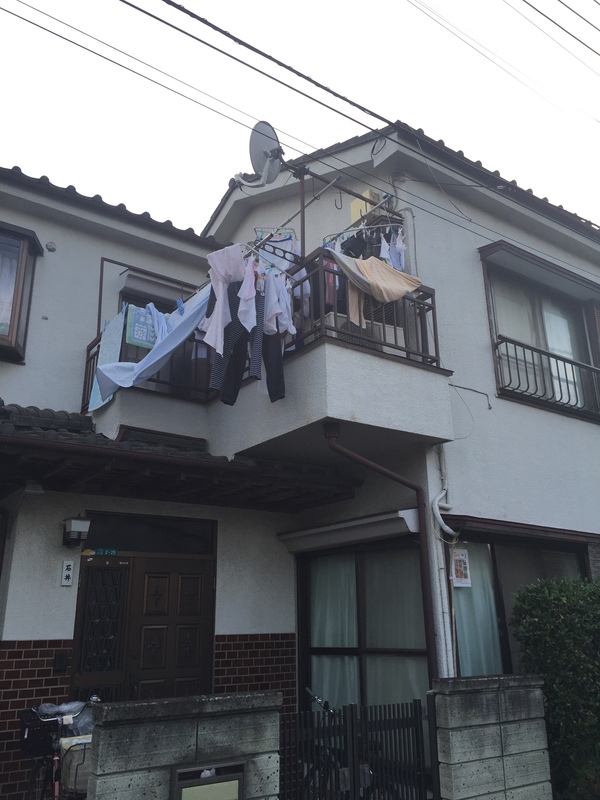 In Japan, it is common to see loads of laundry danging from balconies, billowing in the breeze. (Or in the winter, hanging stiff as a board.) It seems like everyone in Japan hangs out their laundry. It’s the complete opposite here in America. Hardly anyone hangs their clothes. Growing up, my mom had a giant clothesline that was always full in the summer. As a teenager, I would die of embarrassment at the thought of my underwear and bras on display in the back yard. But there really isn’t anything like putting on a shirt that’s been drying in the sun all day. I know my mom is in the minority though, even in her small town that doesn’t scoff at “unsightly” clothing hanging in the backyard. Where I live, our condo association has rules against drying clothes on our balconies. (I’ve started breaking this rule a bit, putting small bits of laundry outside draped across a chair or on my drying rack. Unfortunately, I don’t have room to hang all of my laundry discreetly.) Most cities or associations have similar rules, making us slaves to our dryers. It’s sad for the environment, really. And I’m not really sure what’s so offensive about hanging laundry. Naoto said his mom always preferred to hang out her laundry, especially the futon and other bedding, because the sun and cold air would kill the germs. Because air drying the laundry is so common in Japan, they have the best little tools for doing it. From circular hangers for socks and lingerie, to heavy duty clamps for blankets and towels, and even cut cat-shaped pins, they have really perfected the art of laundry! To see all of the Japan Does It Better (JDIB) series, go here. 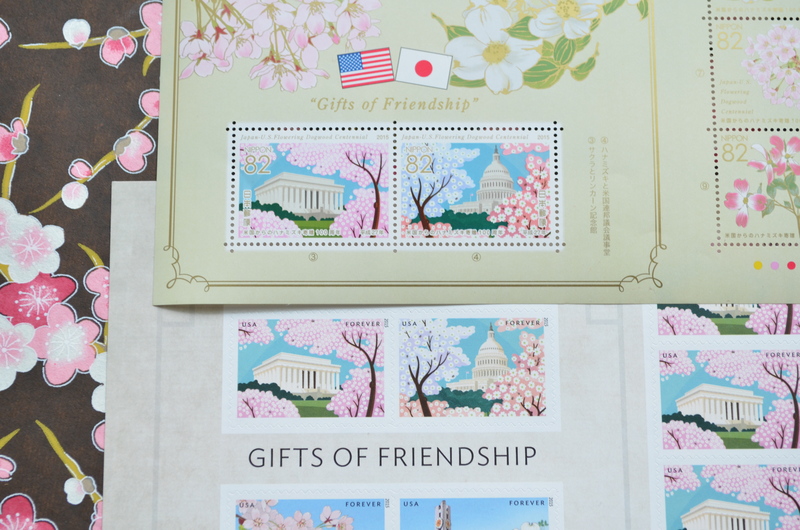 Have you seen the Gifts of Friendship stamps released in the U.S. and Japan? 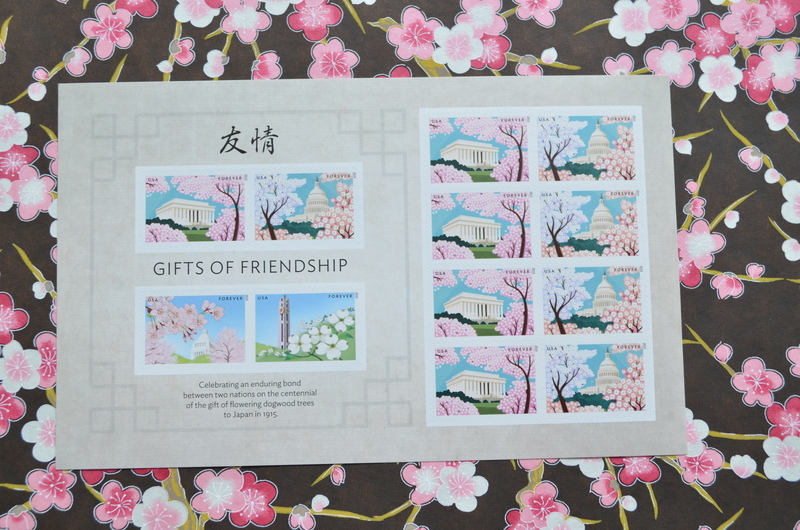 The stamps celebrate the exchange of flowering tree gifts between the US and Japan. In 1912, the US received a gift of over three thousand flowering cherry trees from Japan. In 1915, the U.S. returned the favor by sending fifty dogwood trees to Japan. These stamps celebrate the 100th anniversary of that gift. Since I am a huge lover of cherry blossoms, I preordered loads of the U.S. version to use on my spring mail. 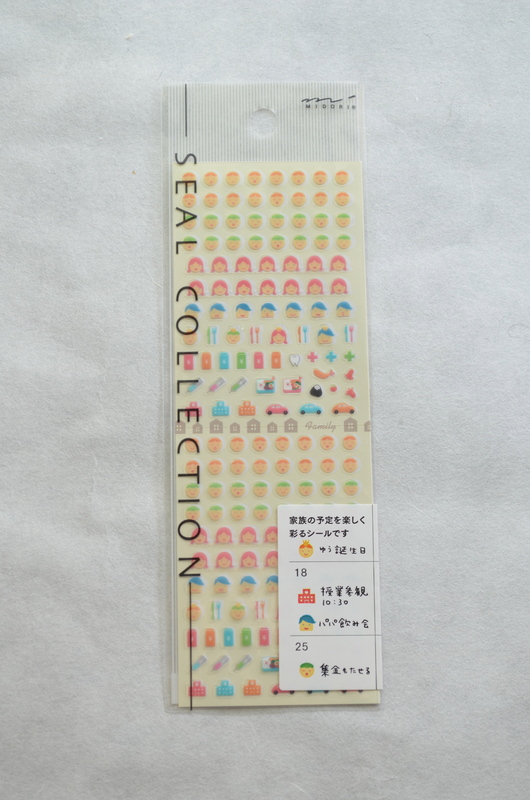 I also asked my sister-in-law if she would buy a sheet of the Japanese version for my stamp collection. Lucky for me, a care package arrived from Japan this weekend (with lots of treats for Naoto and me!) and two sheets of the Japanese stamps were tucked inside. 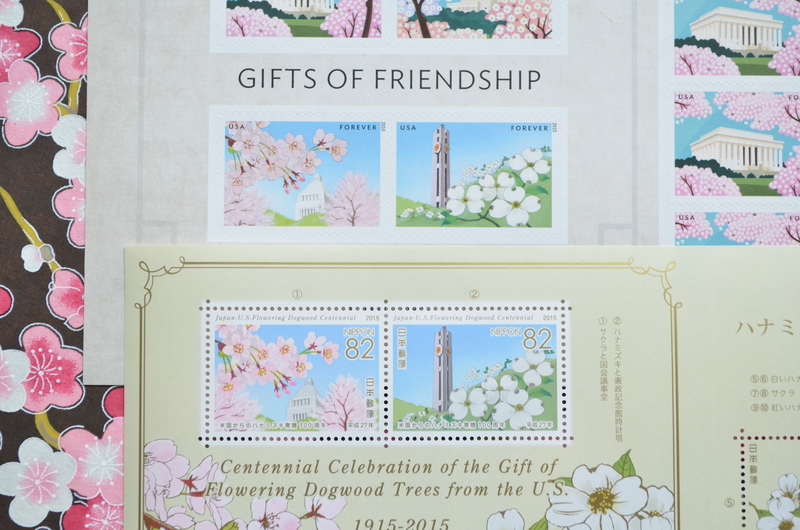 I really love the U.S. version, even though they are reminiscent of the cherry blossom stamps issued a few years ago for the centennial of the 1912 cherry tree gifts. The US sheet contains ten of the US stamps and features two of the Japanese version (but for use in the U.S.). I think the colors on the U.S. version are perfectly springy with the pretty blue skies and pinks and corals and pale purples of the flowering trees. 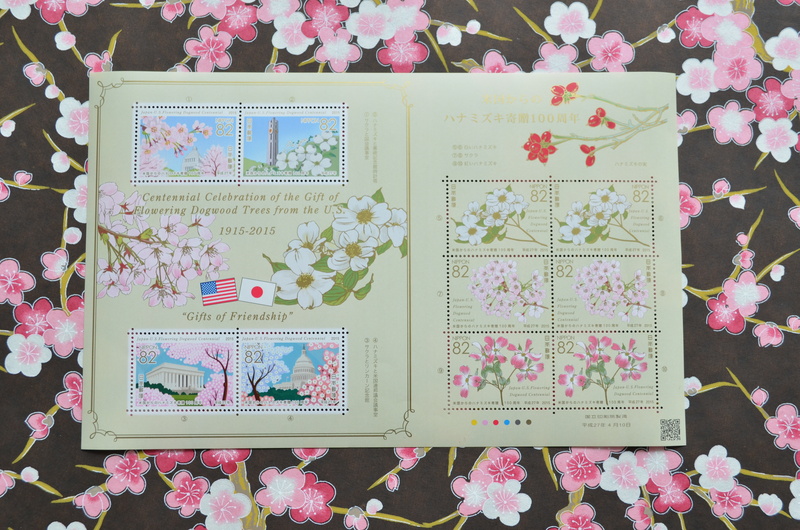 And the Japanese ones are lovely, featuring close-ups of the cherry blossoms and dogwood blooms with Japan’s Diet (Congress) and Constitutional Memorial Clocktower respectively in the backgrounds. The Japanese sheet contains the US and Japanese versions as well as six other stamps that highlight the white dogwood, cherry, and red dogwood branches on a simple cream background. I love that Japan added this variety to their edition. On the US versions, the writing is very spare, just noting USA, 2015, and the “Forever” denomination on the stamps in plain black text. The Japanese versions are accented with gold text of the 82 yen denomination and “Japan-U.S. Flowering Dogwood Centennial” in both English and Japanese. 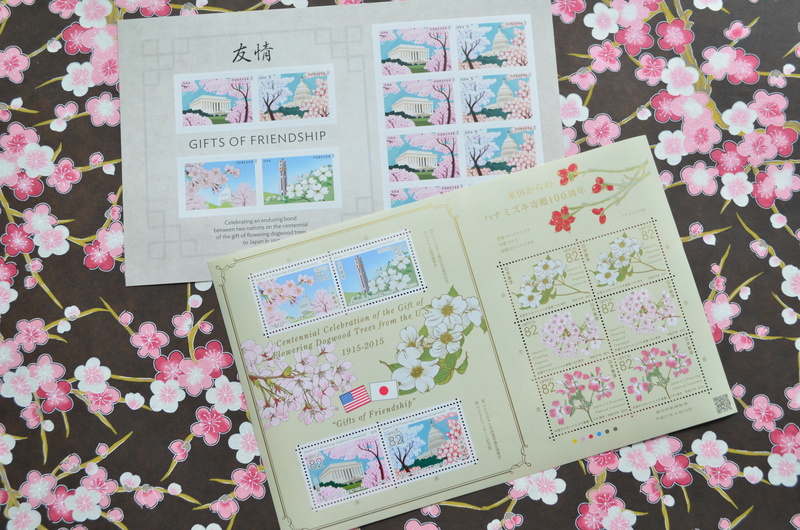 The U.S. version is much more spare than the Japanese version, which seems to celebrate the exchange with both countries’ flags and the flowering trees decorating the sheet. I do love both versions and it’s not often that two countries can go head-to-head in a sheet of stamps battle. But I do think, in this case, because of the variety and the gold details that this is another case of Japan Does It Better! To see the rest of the Japan Does It Better posts, go here. 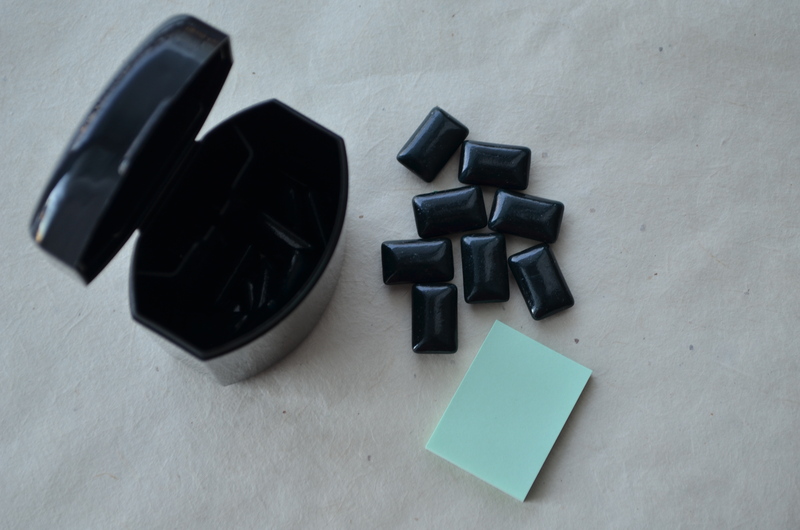 Naoto is a big fan of BlackBlack gum, a Japanese gum that is infused with caffeine*. The taste is strong and minty, and apparently, caffeine is absorbed into the body faster with gum than drinking coffee or pop. Naoto usually buys the little packs of five sticks, but the last time we went to Mitsuwa he could only find the large size of the tablet gum. It’s hard to see in my picture (it’s DARK here in Chicagoland! 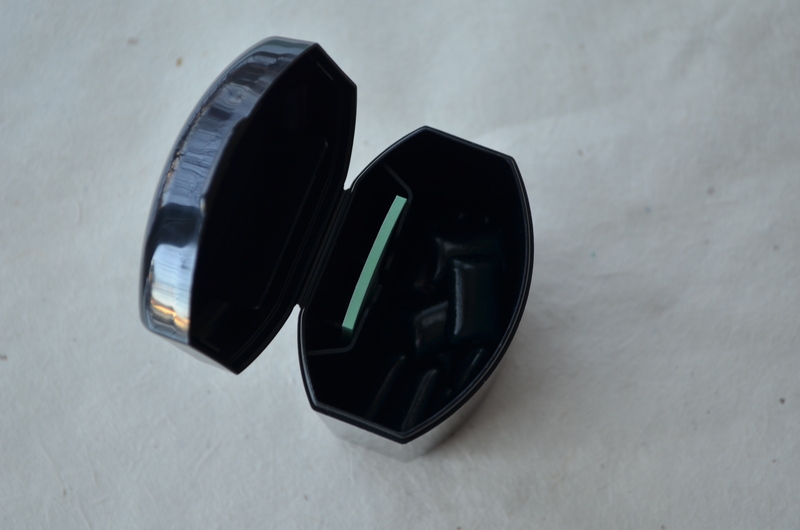 ), but inside the container is a slot with a little stack of papers for wrapping up your used gum before it’s discarded. Isn’t that genius? When I have a stick of gum, I keep the paper to spit it out in, but when I have the canisters of gum, I’m at the mercy of finding a nearby trash can. This tiny pad of paper solves that problem. I’m sure BlackBlack isn’t the only gum that has the handy paper option…I’ll have to keep my eyes open for more options on our next trip. Tidy ways to dispose of your gum…another example of how Japan Does It Better! To see all of the other JDIB posts, go here. *I don’t get it…in a world with coffee, why would I want to get my caffeine any other way? 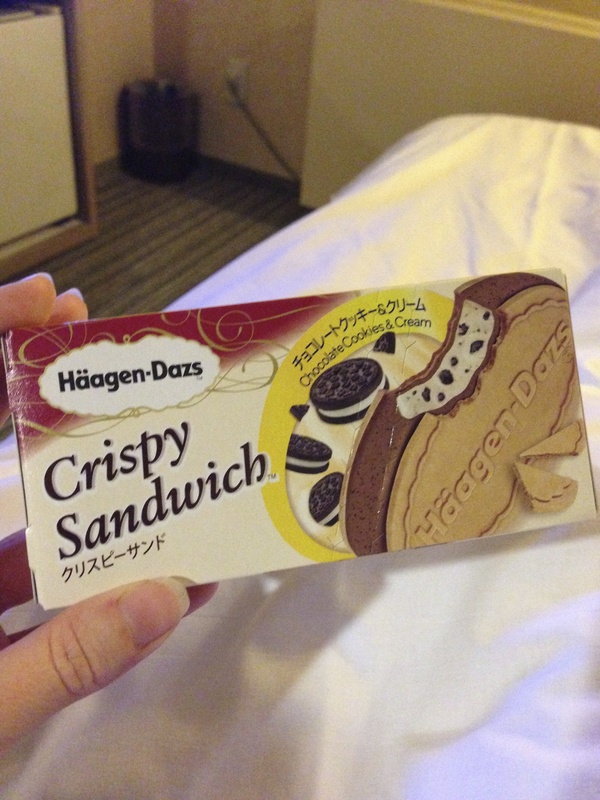 The Häagen-Dazs Crispy Sandwich is an ice cream sandwich made with ice cream (in this case cookies & cream which is, in my opinion, the best!) coated in a hard shell and sandwiched between two crispy wafers. The wafers taste kind of like an ice cream cone, but they are thinner. They add a nice crunch and texture, but not a ton of taste which allows you to focus on the yummy ice cream and coating. The Crispy Sandwich takes the ice cream sandwich to a whole new level…so good. So very good. Crispy Sandwiches can be found at just about any convenience store, which makes them waaaaay too easy to eat every day. (Not that anyone is guilty of eating one every day during her two week trip or anything…) I tried the plain vanilla and the special spring sakura versions, but truthfully, cookies & cream wins. I’ve read about a green tea version and will make it my mission to find one during our next trip. Tastier ice cream sandwiches…another reason Japan Does It Better! For more JDIB posts, go here. I, like most people, hate feeling itchy. In the summers, I usually carry hydrocortisone cream around with me at all times because bug bites can be annoying and distracting. The cream is a fine solution, but it’s a little messy and I always like to wash my hands after using, which isn’t always possible right away. 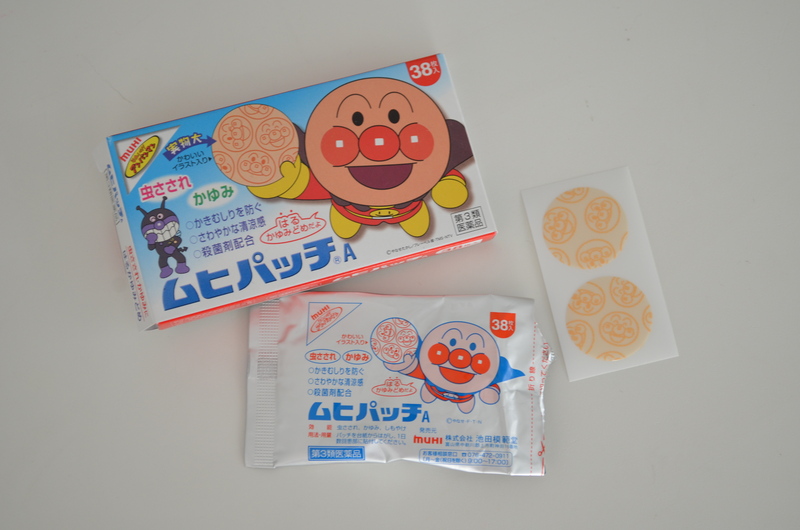 Our friends Billy and Angela happened upon these amazing anti-itch patches when they were traveling in Japan and we picked up a pack last summer. Now, I can’t imagine a better way to treat a bug bite. Inside the box are these little medicated decals that peel off and go right over the bug bite. The patches are kind of like Band-Aids, except they are thinner and completely adhesive. The medicine almost immediately stops the itching and the decal protects the bug bite from your constant scratching. Once I put one of these on, I leave it on for a day or two. The patches stand up well to water (they stay on during showers!) and really cure any itches. 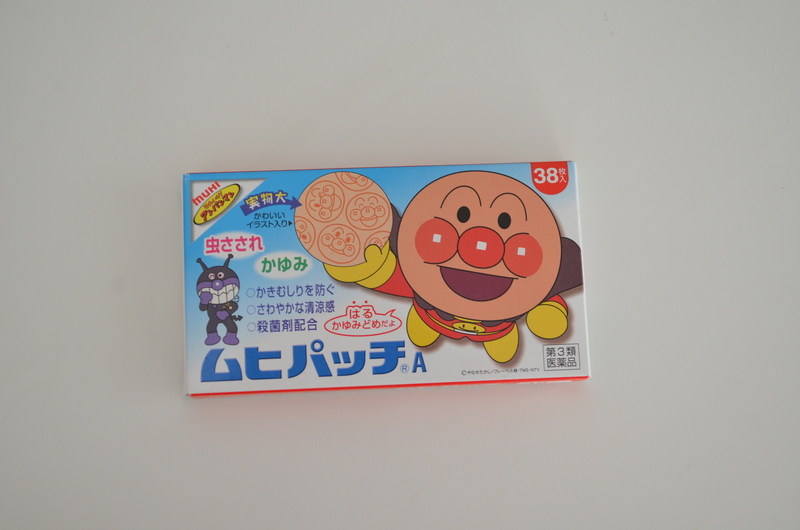 The package we bought has the Anpanman character on the patches, but there are also plain (boring) ones if characters aren’t your thing. For a super portable and effective way to treat bug bites, Japan Does It Better! For the rest of the JDIB posts, go here. I’m a sucker for things that burn…well, technically for toiletries that cool. 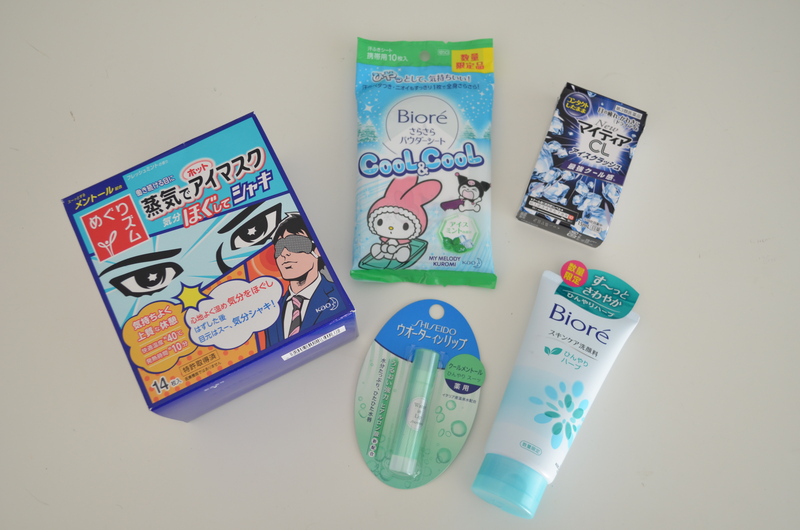 And Japan seems to have the market cornered when it comes to cooling your skin, eyes, lips and more with toiletries that include menthol. The menthol is invigorating! Last summer, my love for all things cooling started with the Biore face wash and the Shiseido lip balm that refreshed my face and lips in the hot, humid Tokyo weather. 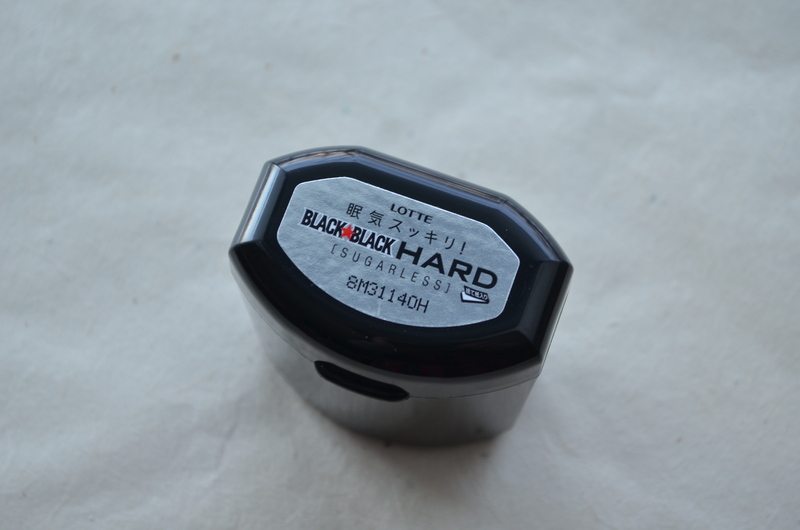 When we went back in March, I was on the hunt for more of that lip balm and some other cooling products. Naoto found some cooling eye masks (which will be a future JDIB post) and I found the cooling powder sheets (featured in JDIB 15). Both provide the perfect relief on a steamy day. The powder sheets have been the best thing this week because I’ve been able to freshen up after my walk to work in the soupy humidity. And the most interesting menthol toiletry of all is the cooling eye drops. They are crazy weird–the very second you feel the drops in your eyes, you feel a moment of regret because it burns and it’s scary, then right away that passes and it’s just cooling, invigorating relief. They really perk you up after a nap, or before an early morning coffee run. Tingling toiletries…Japan Does It Better!! To see all JDIB posts, go here. If you visit any stationery store in Tokyo you will find aisles upon aisles devoted to calendar keeping. 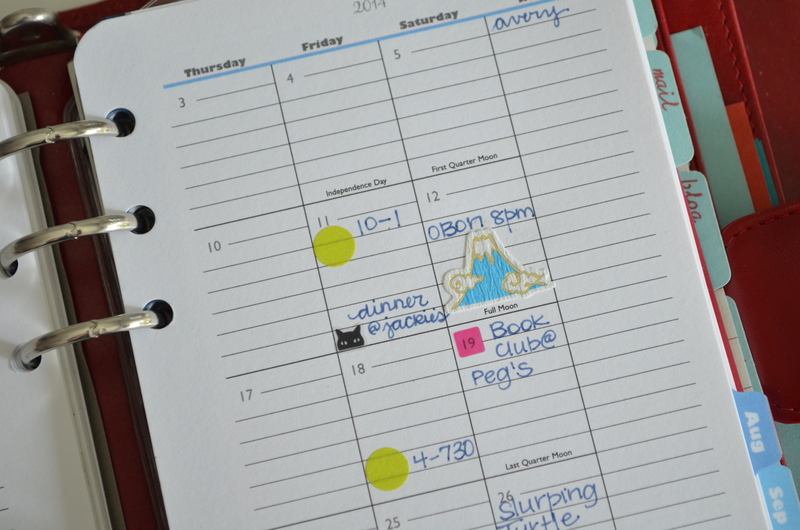 Not only are there tons of options for calendars and datebooks but there are tons of styles of these tiny stickers to help keep your appointments, duties, birthdays and other special events organized. 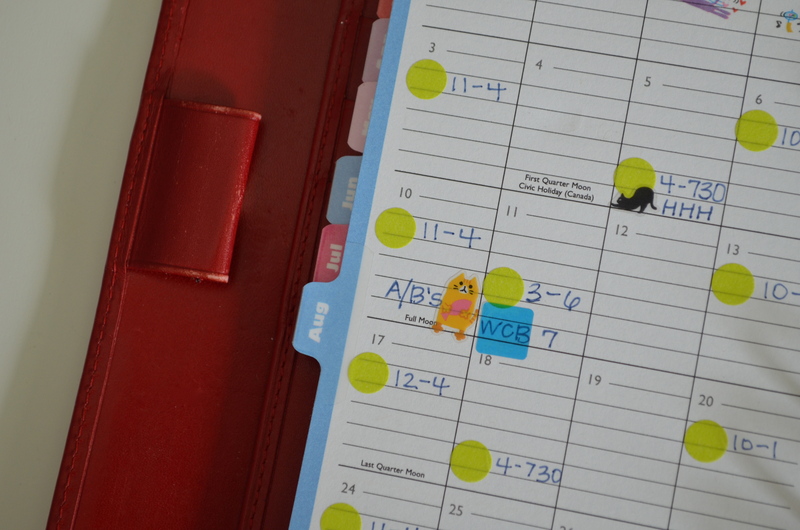 I am a big fan of using my paper datebook and I couldn’t resist picking up a new set of calendar stickers at each stationery store I visited. 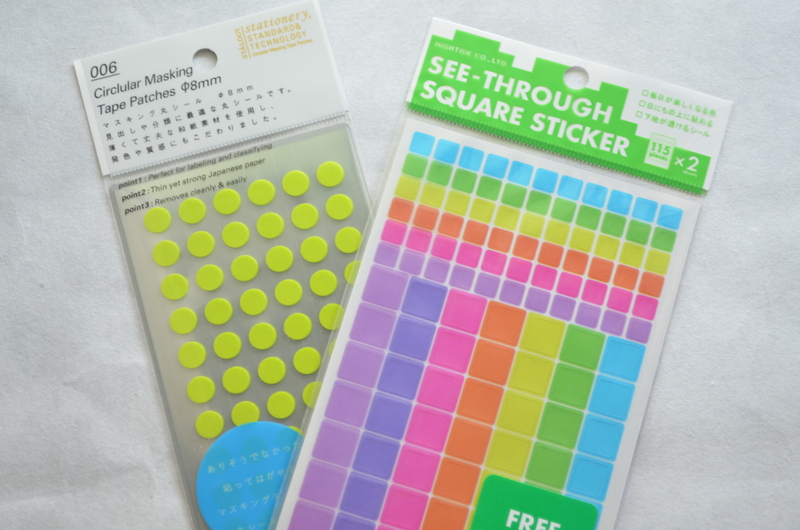 I bought some basic green washi dots to mark my work schedule and some basic see through colored squares for random appointments like board meetings and book group. 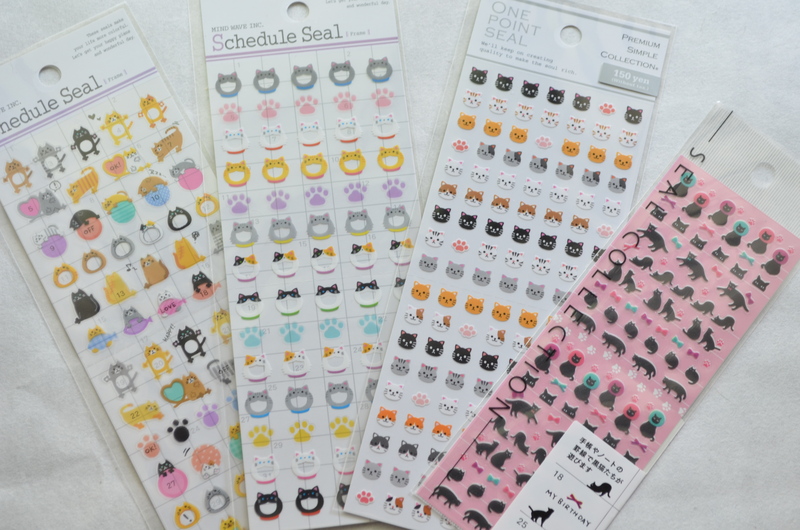 Most of the stickers I purchased are cat-themed. 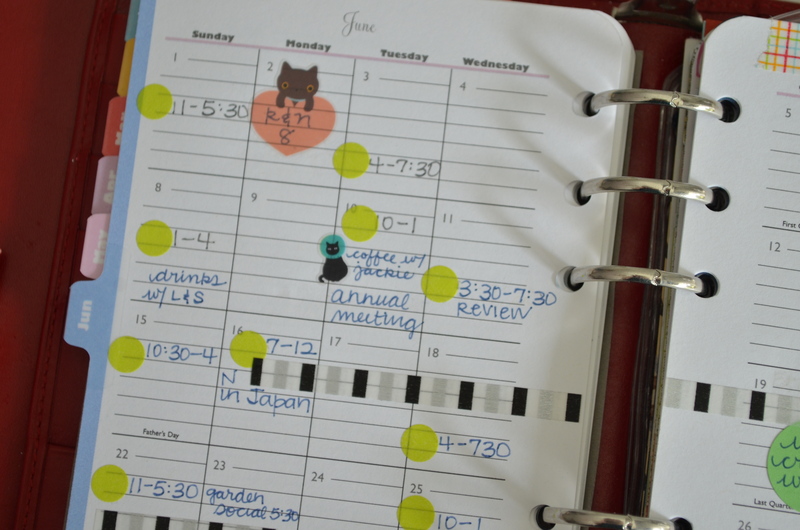 I use the cats and some other stickers I have in my stash to mark parties, coffee dates, birthdays and anniversaries. 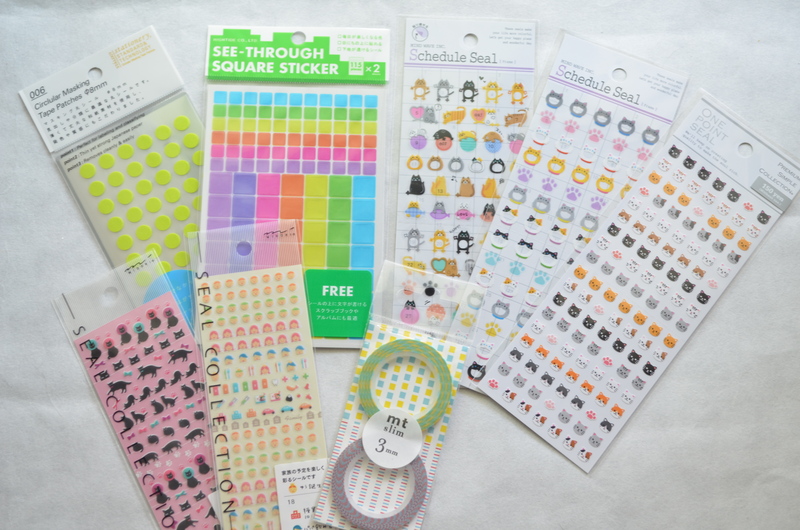 These stickers are the most literal calendar stickers. 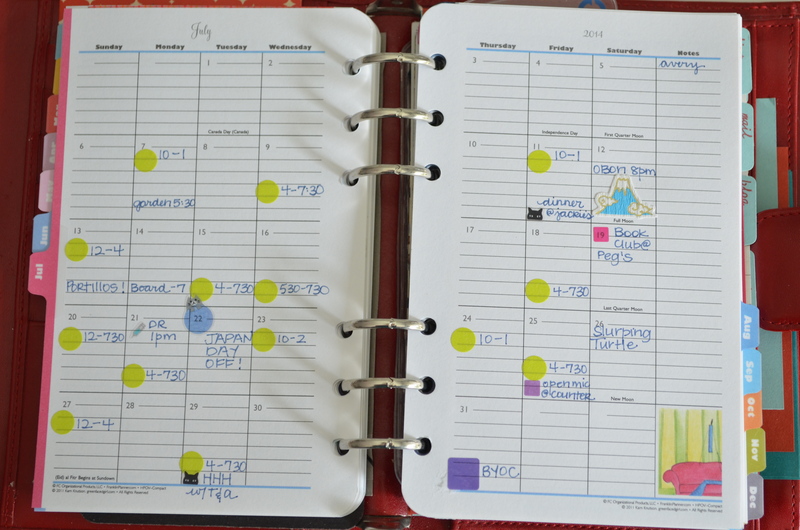 I just started using them to mark doctor’s appointments, car repair appointments and classes. 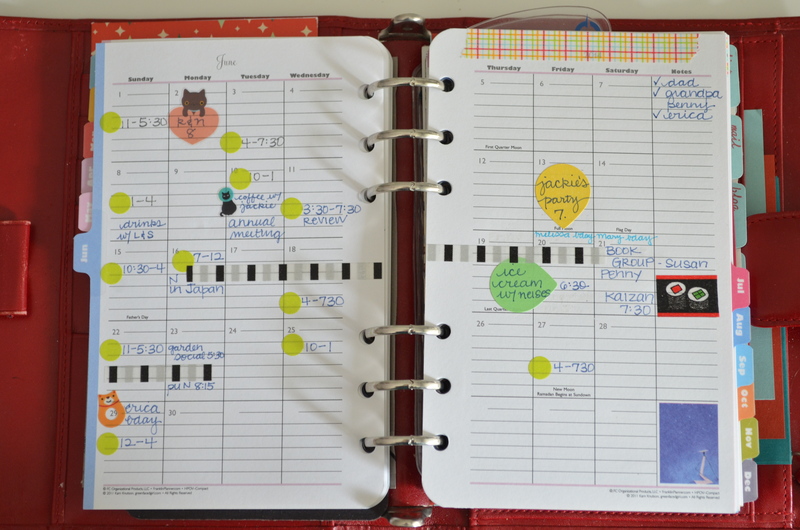 I love looking at my month-at-a-glance page and seeing the cats, washi tapes and other stickers highlighting the fun activities each month. Leave it to Japan to make something cute and practical! 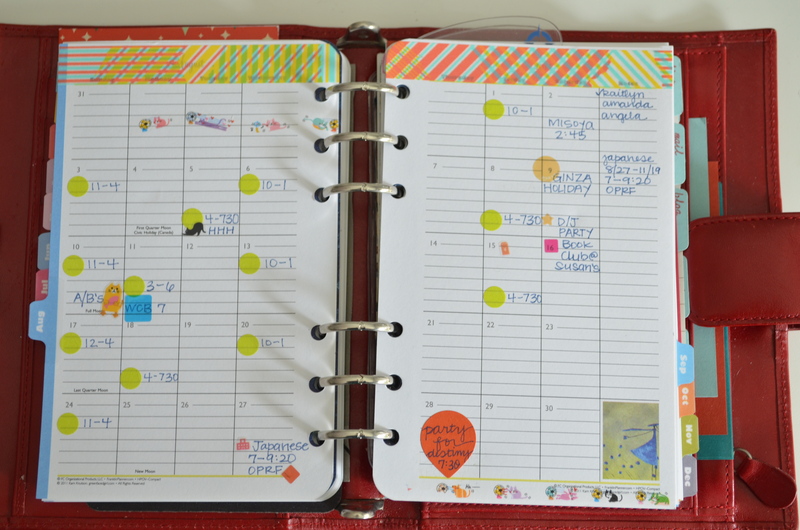 When it comes to kawaii calendar organization, Japan Does It Better! To see the other JDIB posts, go here. Then, on our first trip to Japan, his sister took me over to the grocery store shelf that held the canned cocktails. Canned cocktails are just pre-packaged cocktails, often made with shochu and fruit juice. They aren’t as tasty as an Old Fashioned or a Tom Collins but they are good enough for a picnic. They are light and fruity and carbonated, easy to drink (and sometimes they sneak up on you…) Canned cocktails come in all sorts of flavors. Naoto’s sisters sent these home with him to give to me. The STRONG brand one is lemon and it is a potent 9% alcohol (hence the name). 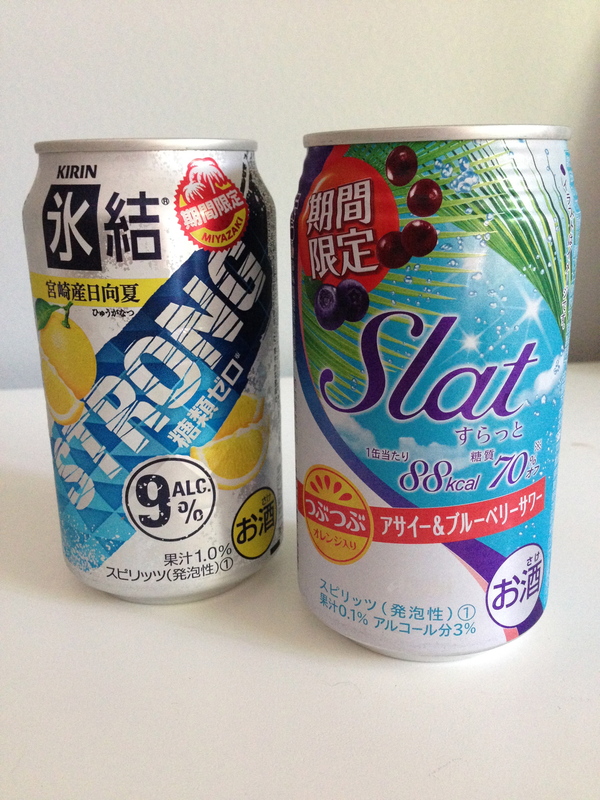 The Slat brand one is made with the açai berry and blueberry and it contains orange pulp (according to the red label with the orange icon). Slat is a much weaker 3% alcohol…there’s a little something for everyone’s tolerance! Maybe the American equivalent of a canned cocktail is a Mike’s Hard Lemonade (gross) or a wine cooler (double gross), but trust me…the Japanese versions are tastier and I love that they include real fruit. Portable options for non-beer drinkers…Japan Does It Better!! To see more JDIB posts, go here. Let’s talk for a moment about showering, shall we? Have you ever showered in the morning, then realized that the weather reports are all wrong again and it wouldn’t be raining yet again, in spite of all the warnings from the weather person and your iPhone? So, you put on your gardening clothes and pop over to the garden to water your poor, thirsty tomatoes that you’ve neglected because of said weather reports. You water the plants in the hot sun and try to get on with your day (which involves seeing more people than your cat at home), but you are a little bit sweaty from being in the humid Chicago air. Do you take another shower? Do you skip the shower and feel sticky and gross for the rest of the day and hope that no one notices? 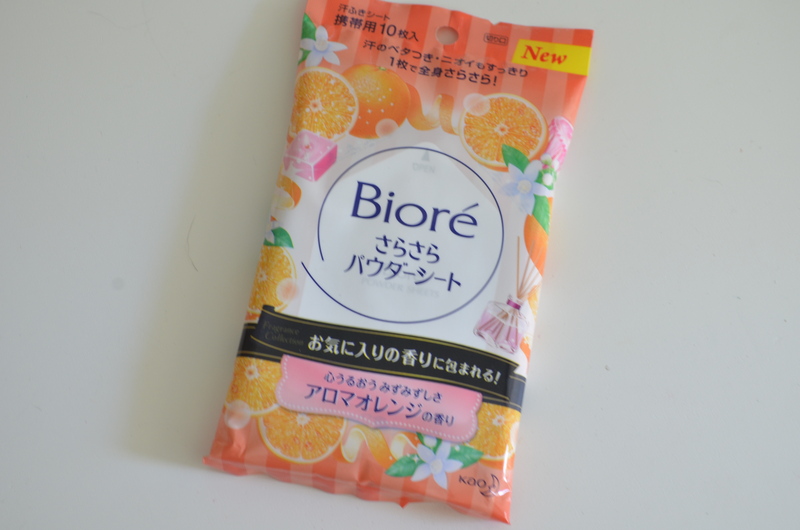 Biore Powder Sheets…yep, Japan Does It Better! P.S. Apparently Ban has introduced something similar in the U.S. I haven’t tried them yet to compare. If you’ve tried them, please let me know what you think. Hopefully Biore will take note and bring theirs to the U.S. too!